2003-03-27 Assigned to AGILENT TECHNOLOGIES, INC. reassignment AGILENT TECHNOLOGIES, INC. ASSIGNMENT OF ASSIGNORS INTEREST (SEE DOCUMENT FOR DETAILS). Assignors: ILLOUZ, MIKA, MINOR, JAMES M.
Systems methods and recordable media for predicting multi-variable outcomes based on multivariable inputs. Additionally, the models described can be used to predict the multi-variable inputs themselves, based on the multi-variable inputs, providing a smoothing function, acting as a noise filter. Both multi-variable inputs and multi-variable outputs may be simultaneously predicted, based upon the multi-variable inputs. The models find a critical subset of data points, or “tent poles” to optimally model all outcome variables simultaneously to leverage communalities among outcomes. This application claims the benefit of U.S. Provisional Application No. 60/368,586, filed Mar. 29, 2002, which application is incorporated herein, in its entirety, by reference thereto. The present invention finds a critical subset of data points to optimally model all outcome variables simultaneously to leverage both communalities among outcomes and uniqueness properties of each outcome. The method relates measured variables associated with a complex phenomenon using a simple direct functional process that eliminates artifactual inferences even if the data is sparse or limited and the variable space is high dimensional. The present invention can also be layered to model higher-ordered features, e.g., output of a GSMILES network can be input to a second GSMILES network. Such GSMILES networks may include feedback loops. If profiles include one or more ordered indices such as “time,” GSMILES networks can incorporate the ordering of such indices (i.e., “time” series). GSMILES also provides statistical evaluations and diagnostics of the analysis, both retrospective and prospective scenarios. GSMILES reduces random noise by combining data from replicate and nearby adjacent information (i.e., pseudo-replicates). FIG. 4 is a diagram of a function  400 shown in a three-dimensional space, illustrating support locations along the function that can be “supported” by critical values (or profiles, i.e., the locations for the alpha coefficients representing the size and direction of the “tent pole”) in the X-Y space. The present invention provides methods and systems for extracting meaningful information from the rapidly growing amount of genomic and clinical data, using sophisticated statistical algorithms and natural language processing. The block diagram in FIG. 1 illustrates an exemplary architecture of a predictor system  100 according to one embodiment of the present invention. The predictor system 100 takes input from various sources (such as microarrays 102, bioassays 104, chemical data 106, genomics/proteomics 108, publications/patents/proprietary documentation 110, medical data 112, and patient records 114, (as indicated in FIG. 1) and preprocesses the input using one or more of the ETL (Extraction/Transformation/Loading module, a standard data mining module for getting the data into a format you can work with) 120, text mining 122, Blast 124, and data interpretation 124 modules. The ETL module  120 extracts data relating to one or more entities (e.g., compounds) from a data source. The extracted data correspond to input and output variables to be used in the GSMILES model for the particular compound. Examples of data extraction and manipulation tasks supported by the ETL module include XML parsing; recognizing various columns and row delimiters in unstructured files; and automatic recognition of the structure of a file (e.g., XML, unstructured, or some other data exchange format). The text mining module  122 processes textual input from sources such as publications 110 and patient records 114. Text mining module 122 produces two types of outputs: structured output stored in the database 130, and unstructured keyword vectors stored in an inverted index (Text Index) 132. Unlike a conventional inverted index, Text Index 132 also preferably functions to retrieve pre-computed keyword vectors. This is important for text types such as patient records. In one embodiment, text mining module  122 includes three components: a term matching component (including specialized dictionaries and regular expression parsers for mapping text strings to entities in an underlying ontology); a relationship mapping component (including patterns that occur in general language as well as patterns that are specific to the domain) for recognizing relationships between entities in text (such as drug-protein interactions and gene-disease causal relationships); and a learning component which learns terms and relationships based on an initial set of terms and relationships supplied by a domain expert. In one embodiment, text mining module  122 uses techniques taught by the FASTUS (Finite State Automaton Text Understanding System) System, developed by SRI International, Menlo Park, Calif. These techniques are described in Hobbs et al., “FASTUS: A Cascaded Finite-State Transducer for Extracting Information form Natural-Language Text”, which can be found at http://www.ai.sri.com/natural-language/projects/fastus.html, and which is incorporated herein, in its entirety, by reference thereto. Text mining techniques are well-known in the art, and a comprehensive discussion thereof can be found in the textbook by Christopher D. Manning & Hinrich Schutze, Foundations of Statistical Natural Language Processing (MIT Press: 1st ed., 1999). The Blast or Homology module  124 detects sequence data in data sources (e.g., microarrays 102, patents 110, patient records 114, etc. ), and stores them in a unified format such as FASTA The Homology module 124 uses BLAST or other known sequence identification methods. Homology module 124 is called interactively for sequence similarity computation by GSMILES 140 (if sequence similarity is part of the overall similarity between data points computed). Data interpretation module  126 performs a number of tasks that go beyond the more mechanical processing done by ETL module 120. One of the tasks performed by data interpretation module 126 is that of imputation, where missing data are filled in, where possible, using GSMILES processing. Another function of data interpretation module is data linkage. If the same data type occurs in several sources, but under different names, then data interpretation module 126 reconciles the apparent disparity offered by the different names, by linking these terms (e.g., such as when different naming conventions are used for drugs or genes). Client  150 allows a user to interact with the system 100. In data source selection, the user selects which data sources are most important for a particular prediction task. I a new data source has become available, the user may add the new data source to the system 100. Weighting may be employed to determine the relative significance, or weight, of various data sources. For example, if a user has prior knowledge indicating that most of the predictive power comes from microarrays for a particular classification task, then the user would indicate this with a large weighting factor applied to the microarrays data source. The client  150 performs output function selection when the user selects one or more particular output categories of interest (i.e., the response variables). When a response variable is used for the first time, the user needs to make it accessible to the system and configure it (e.g., the user determines what kind of response variable it is, such as continuous, dichotomous, polytomous, etc.). By processing the preprocessed data received from ETL  120, text mining 122, Blast 124 and/or data interpretation 126 modules to arrive at predictive values according to the selected output function or functions, GSMILES 140 may provide valuable predictive information as to compound similarities 152, toxicity 154, efficacy 156, and diagnosis 158, but is not limited to such output functions, as has been noted earlier. Information may be exchanged with Text Index  132. Module(s)  120,122,124 and/or 126 exchange(s) data with RDBMS 130 and/or Text Index 132, as described above. The preprocessed data from module(s) 120,122,124 and/or 126 are fed into GSMILES (Generalized Similarity Least Squares Modeling Method) predictor module 140, which again exchanges data with Text Index 132 and RDBMS 130, but also takes input from client 150, for example, as to data source selection, weighting of data points, and output function selection. The output from GSMILES 140 may include predictions for various compounds of diagnosis, efficacy, toxicity, and compound similarity, among others. One important aspect of the methods and systems disclosed concerns their use in the prediction of the suitability of new compounds for drug development. GSMILES predictor  140 may predict various aspects of a compound, such as toxicity, mode of action, indication and drug success, as well as consideration of similar compounds, while accepting user input to the various corresponding models. The sum of all the prediction results can be used at the end to decide which compound to pursue. By predicting a compound's mode of action, toxicology, and other attributes, the present invention facilitates lead prioritization and helps design experiments. The present system may utilize the Generalized Similarity Least Squares (GSMILES) modeling method to reveal association patterns within genomic, proteomic, clinical, and chemical information and predict related outcomes such as disease state, response to therapy, survival time, toxic events, genomic properties, immune response/rejection level, and measures of kinetics/efficacy of single or multiple therapeutics. The GSMILES methodology performed by GSMILES module  140 is further discussed in the next section. Other possible applications of GSMILES include economic predictions, early detection of critical earthquake-related processes from appropriately filtered seismic signals and other geophysical measurements, and process models for process control of complex chemical processes to improve efficiency and protect the environment. The GSMILES methodology finds the strategic locations in matrix X  240 and determines p to optimize the prospective representation of the Y-profiles 340, including optimization of relationships within the Y-profiles. Referring to FIG. 3, GSMILES arranges the X-profile and Y-profile, and also a noise profile  440 in a matrix 300. Noises are like hidden variables. Noises are ever present but it is not known how to extract the values of these variables. All inference models must accommodate noise. Each row of matrix 300 represents a series of values for related variables, e.g., the X-values for row 1 of the matrix could be known, measured, or inputted values (or may even be dummy variables) which directly effect the Y-values of row 1, which can be thought of as outpit or outcome values, and wherein the No-values (noise) represent the noise values associated with each row. The left-side 340 of the rows of matrix 300, which are populated by the X variables in FIG. 3 define the X-profile of the problem and the right-side (340, 440) of the rows of matrix 300, which are populated by the Y and No variables in FIG. 3 define the Y-profile and noise associated with the rows. Each row of matrix  300 may be treated as a data object, i.e., an encapsulation of related information. The GSMILES methodology analyzes these objects and compares them with some measure of similarity (or dissimilarity). A fundamental underlying assumption of the GSMILES methodology is that if the X values are close in similarity, then the Y-values associated with those rows will also be close in value. By processing the objects in the matrix 300, a similarity transform matrix may be constructed using similarity values between selected rows of the X-profile, as will be described in more detail below. The X-profile objects (rows) are used to determine similarity among one another to produce similarity values used in the similarity transform matrix. Similarity between rows may be calculated by many different known similarity algorithms, including, but not limited to Euclidean distance, Hamming distance, Minkowski weighted distance, or other known distance measurement algorithms. The normalized Hamming function measures the number of bits that are dissimilar in two binary sets. The Tanimoto or Jaccard coefficient measures the number of bits shared by two molecules relative to the ones they could have in common. The Dice coefficient may also be used, as well as similarity metrics between images or signal signatures when the input contains images or other signal patterns, as known to those of ordinary skill in the art. With any set of data being analyzed, such as the data in matrix  300, for example, it has been found that certain, select X-profiles among the objects are more critical in defining the relationship of the function sought than are the remainder of the X-profiles. GSMILES solves for these critical profiles that give critical information about the relationship between the X values and the Y values. Conceptually speaking, if a function  400 is observed in a three-dimensional space, as shown in FIG. 4, there are certain domain locations of the function identifying features that can be “supported” by nearby critical data values (or profiles) in the X-Y space. For example, the points 410 and 420 in FIG. 4 are such critical values in the X-Y space. When these locations become the centroids of support for the range of the function, as facilitated by similarity functions, they tend to adequately support the total surface shape of the range of the function. Because of the appearance of this conceptual model, where the function range appears somewhat like a circus tent, and the critical domain locations, together with their extended impact, appear as tent poles, the present inventors refer to the critical profiles as “tent poles”. Of course these “tent poles” can be positive or negative as applied to a mathematical function. This same concept applies to high dimensional problems and functions. GSMILES calculates the critical profiles, which define the locations of the “tent poles”, as well as their optimized coefficients (i.e., length or size of the tent poles). To solve for the critical profiles, an initial model (called Model Zero (Model 0) is inputted to the system, in matrix T (See FIG. 5). Model Zero (designated as μ 0 in FIG. 5), may be a conventional model, conceptual model, theoretical model, and X-profile with known Y-profile outcomes, or some other reasonable model which characterizes a rough approximation of the association between the X- and Y-profiles, but still cannot explain or account for a lot of systematic patterns effecting the problem. Thus, Model Zero predicts Y (i.e., the Y values in the Y-profile), but not adequately. Alternatively, a null set could be used as Model Zero, or a column of equal constants, such as a column with each row in the column being the value 1 (one). ε=error matrix, or residuals, in this example characterizing Model Zero with ε 0 values. Whatever technique is used to determine the maximum absolute error, the row from which the maximum absolute error is noted and used to identify the row (X-profile) from matrix  240, from which similarity values are calculated. The calculated similarity values are used to populate the next column of values in the matrix containing Model Zero. For example, at this stage of the processing, the similarity values will be used to populate the second column of the matrix, adjacent the Model Zero values. However, this is an iterative process which can be used to populate as many columns as necessary to produce a “good or adequate fit”, i.e., to refine the model so that it predicts Y-profiles within acceptable error ranges. An acceptable error range will vary depending upon the particular problem that is being studied, and the nature of the Y-profiles. For example, a model to predict temperatures may require predictions within an error range of ±1° C. for one application, while another application for predicting temperature may require predictions within an error range of ±0.01° C. GSMILES is readily adaptable to customize a model to meet the required accuracy of the predictions that it produces. Assuming, for exemplary purposes, that the row from which the maximum absolute error was found in matrix E was the seventh, GSMILES then identifies the seventh row in matrix  240 to perform the similarity calculations from. Similarity calculations are performed between the seventh X-profile and each of the other X-profile rows, including the seventh row X-profile with itself. For example, the first row similarity value in column 2, FIG. 7 (i.e., S7,1) is populated with the similarity value calculated between rows 7 and 1 of the X-profile matrix 240. The second row similarity value in column 2, FIG. 7 is populated with the similarity value S7,2, the similarity value calculated between rows 7 and 2, and so forth. Note that row 7 is populated with a similarity value calculated between row 7 with itself. This will be the maximum similarity value, as a row is most similar with itself and any replicate rows. The similarity values may be normalized so that the maximum similarity value is assigned a value of 1 (one) and the least similar value would in that case be zero. As noted, row 7 was only chosen as an example, but analogous calculations would be performed with regard to any row in the matrix 240 which was identified as corresponding to the highest maximum absolute error value, as would be apparent to those of ordinary skill in the art. It is further noted that selection does not have to be based upon the maximum absolute error value, but may be based on any predefined ensemble error scoring. For example, an ensemble average absolute error, ensemble median absolute error, ensemble mode absolute error, ensemble weighted average absolute error, ensemble robust average absolute error, geometric average, ensemble error divided by standard deviation of errors of ensemble, or other predefined absolute error measure may be used in place of the maximum absolute error or maximum ensemble absolute error. The X-profile row selected for calculating the similarity values marks the location of the first critical profile or “tent pole” identified by GSMILES for the model. A least squares regression algorithm is again performed next, this time to solve for coefficients α 0 and α1 in the matrix a shown in FIG. 6). Note, that since the T matrix is now an N×2 matrix, that matrix a needs to be a 2×M matrix, where the first row is populated with the α0 coefficients (i.e., α0 1,1, α0 1,2, . . . α0 1,M), and the second row is populated with the α1 coefficients (i.e., α1 1,1, α1 1,2, . . . α1 1,M). The α0 coefficients that were calculated in the first iteration using only Model Zero are discarded, so that new α0 coefficients are solved for, along with α1 coefficients. These coefficients will provide a best fit for the use of Model Zero and the first tent pole in predicting the Y-profiles. After solving for the coefficients in matrix a, the prediction errors (residuals) are again calculated, using equation (3), where a is a 2×M matrix in this iteration, and T is an N×2 matrix. Each row of α may be considered a transform of the rows of Y. For linear regression, this transformation is linear. Again, GSMILES determines the row of the E matrix which has the maximum absolute value of error, in a manner as described above. Whatever technique is used to determine the maximum absolute error, the row from which the maximum absolute error is noted and used to identify the row (X-profile) from matrix  240, from which similarity values are again calculated. The calculated similarity values are used to populate the next column of values in the T matrix (in this iteration, the third column), which identifies the next tent pole in the model. The X-profile row selected for calculating the similarity values marks the location of the next (second, in this iteration) critical profile or “tent pole” identified by GSMILES for the model. A least squares regression algorithm is again performed, to perform the next iteration of the process, as described above. The GSMILES method can iterate through the above-described steps until the residuals come within the limits of the error range desired for the particular problem that is being solved, i.e., when the maximum error from matrix e in any iteration falls below the error range. An example of an error threshold could be 0.01 or 0.1, or whatever other error level is reasonable for the problem being addressed. With each iteration, an additional tent pole is added to the model, thereby reducing the prediction error resulting in the overall model. Alternatively, GSMILES may continue iterations as long as no two identified tent poles have locations that are too close to one another so as to be statistically indistinct from one another, i.e., significantly collinear. Put another way, GSMILES will not use two tent poles which are highly correlated and hence produce highly correlated similarity columns, i.e., which are collinear or nearly collinear (e.g., correlation squared (R 2)>95%, of the two similarity columns produced by the two X-profiles (tent pole locations). However, even if an X-profile is dissimilar (not near) all selected profiles in the model, it may still suffer collinearity problems with columns in the T-matrix as is. Hence, a tent-pole location is added to the model only if it passes both collinearity filters. When a tent pole (row from matrix  240) is identified from the maximum absolute error in an ε matrix that is determined to be too close (nearly collinear) to a previously selected tent pole, GSMILES rejects this choice and moves to the next largest maximum absolute error value in that E matrix. The row in matrix 240 which corresponds to the next largest maximum absolute error is then examined with regard to the previously selected tent poles, by referring to the similarity column created for each respective selected X-profile. If this new row describes a tent pole which is not collinear or nearly collinear with a previously selected tent pole, then the calculated similarity values are inserted into a new column in matrix T and GSMILES processes another iteration. On the other hand, if it is determined that this row is nearly collinear or collinear with a previously chosen tent pole, GSMILES goes back to the E matrix to select the next highest absolute error value. GSMILES iterates through the error selection process until a tent pole is found which is not collinear or nearly collinear with a previously selected tent pole, or until GSMILES has exhausted all rows of the error matrix ε. When all rows of an error matrix c have been exhausted, the model has its full set of tent poles and no more iterations of the above steps are processed for this model. Referring now to FIG. 8, an example is shown wherein a new X-profile (referred to as X*) is inputted to GSMILES in order to predict a Y-Profile for the same. For simplicity of explanation, this example uses only two tent poles, together with Model Zero, to characterize the GSMILES model. In practice, there will generally be many more tent poles employed. As a result, the α matrix in this example is a 3×M matrix, as shown in FIG. 8, and we have assumed, for example's sake, that the second profile is defined by the third row X-profile of the X-profile matrix  240. Therefore, the similarity values in column 3 of matrix T are populated by similarity values between row three of the X-profile matrix 240 and all rows in the S-profile matrix 240. Again for simplicity, the example uses only a single X* profile, so that only a single row is added to the X-profile  240, making it an (N+1)×n matrix, with the N+1st row being populated with the X* profile values, although GSMILES is capable of handling multiple rows of X-profiles simultaneously, as would be readily apparent to those of ordinary skill in the art in view of the description of FIGS. 3-7 above. Because the X-profile matrix has been expanded to N+1 rows, Model Zero in this case will also contain N+1 components (i.e., is an (N+1)×1 vector)) as shown in FIG. 8. The tent pole similarity values for tent poles one and two (i.e., columns 2 and 3) of the T matrix are populated with the previously calculated similarity values for rows 1−N. Row N+1 of the second column is populated with a similarity value found by calculating the similarity between row 7 and row N+1 (i.e., the X* profile) of the new X-profile matrix  240. Similarly, Row N+1 of the third column is populated with a similarity value found by calculating the similarity between row 7 and row N+1 (i.e., the X* profile) of the new X-profile matrix 240. The initial such Y-score function is estimated by properties of the associated distribution, e.g., for a two-category logistic, assign the value +1 for one class and the value −1 for the other class. Another method uses a high-order polynomial in a conventional distribution analysis to provide the score vector. The high order polynomial is useless for making any type of predictions however. The GSMILES model according to the present invention predicts this score vector, thereby producing a model with high quality and effective prediction properties. The GSMILES model can be further optimized by using the critical S-columns of the similarity matrix directly in the distributional optimization that could also include conventional X-variables and/or Model Zero. Hence, GSMILES provides a manageable set of high-leverage terms for distributional optimizations such as provided by generalized linear, mixed, logistic, ordinal, and survival model regression applications. In this fashion, GSMILES is not restricted to univariate binomial logistic distributions, because GSMILES can predict multiple columns of Y (in the Y-profile  340). Thus, GSMILES can simultaneously perform logistic regression, ordinal regression, survival regression, and other regression procedures involving multiple variable outcomes (multiple responses) as mediated by the score-function device. Some score functions produced by GSMILES do not require distributional models, but are useable as is. For example, for continuous variables, such as temperature, these outcomes can be analyzed by directly using the score function, without the need for logistic analysis. Other non-continuous variable outcomes may also not need logistic analysis, but may be used directly from a score function. For logistic regression, GSMILES assumes a binomial distribution pattern for scoring, while a multinomial distribution is assumed for ordinal regression and a Gaussian distribution is assumed for many other types of regression (continuous variables). When modeling according to the GSMILES methodology, as with any type of prediction model, both fit error (training error) and validation error (test error) are encountered. In this case, fit error is the error that results in the E matrix at the final iteration of determining the α matrix according to the above-described methodology, as GSMILES optimizes the training set (N×n matrix  240) to predict the training set Y-profile 340 (N×M matrix). Validation error is the error resulting from applying the model to an independent data set. For example, the validation error resulting in the example described above with regard to FIG. 8 is the E vector containing the M values of error associated with the N+1st row of the matrix 340 shown in FIG. 8. The leave-one-out cross-validation technique involves estimating the validation error through use of the training set. As an example, assuming that matrix  240,340 in FIG. 3 is the initial training set, the leave-one-out technique involves extracting one of the rows of the training set prior to carrying out the GSMILES methodology to solve for similarity and the a matrix that are described above. So, in this case, the “altered” training set will include an X-profile which is an (N−1)×n matrix and a Y-profile which is an (N−1)×M matrix. The extracted row (for a non-limiting example, we can assume that row 5 was extracted) becomes the validation set that will be used after solving for the GSMILES model. Using the altered training data set, an α matrix is solved for using the techniques described above with regard to the GSMILES least squares methodology. After determining the a matrix, this a matrix is then used to predict the outcome for the extracted row (i.e., the test set, row  5 in the current example). Because the Y-profile of the test set is known, the known Y-values can be compared with the predicted Y-values to determine the validation error and to determine whether this validation error is within the acceptable range of error. The same procedure may be carried out for each row of the original training data set  240,340, one row at a time. In this way, each profile used in the training data set can be used independently as a validation data set. By summing the squares of the errors derived from each extracted row and dividing by the number or rows, a variance can be determined for the validation error (i.e., validation variance). However, to require validation error to be determined by completely processing through the GSMILES methodology to independently determine an a matrix for each extracted row, is to require a great deal of processing time, particularly for typical data sets which may contain thousands of rows. This is both time consuming and expensive, and therefore inefficient. Referring now to FIG. 9, a flow chart  900 identifies some of the important process steps in one example of an iterative procedure employed by GSMILES in determining a predictor model. At step 902, GSMILES module 140 receives inputted data which has been preprocessed according to one or more of the techniques described above. Each profile of associated measurements of variables of the inputted data is treated as an object by GSMILES at step 904, with potentially three classes of information: predictor/driver variables (X-variables), predictee/consequential variables (Y-variables), and nuisance variables (noise variables, known and unknown). Note that these classes are not mutually exclusive; hence, a variable can belong to one or more of these GSMILES classes as dictated by the particular analysis being processed. GSMILES calculates similarity among all objects at step  906, according to the techniques described above. Note that similarity may be compound, e.g., a combination of similarity measures, where each similarity component is specific to a subset of X-profile variables. Note further, that GSMILES may just as well calculate dissimilarity among all objects to arrive at the same results, but for sake of simplicity, only the similarity calculation method is described here, as an example. It would be readily apparent to those of ordinary skill in the statistic arts, as to how to proceed on a basis using dissimilarity. GSMILES uses the similarity values to predict the Y-variables, as described above. However, GSMILES is not limited to predicting Y-variables, but may also be used to predict the X-variables themselves, via the similarity matrix, an operation that functions as a noise filter, or smoothing function, to arrive at a more stable set of X variables. GSMILES may also be used to solve for X-variables and Y-variables simultaneously. When text variables are involved, these variables may appear in one or both of X- and Y-profiles. GSMILES calculates similarity among the text variables, and provides similarity values for these text values with regard to the X-profile, as well as the Y-profile when text is present in the Y-profile. Hence, the set of text Y-variables are replaced by a similarity column to form the new Y-matrix, Y2-matrix. Using the similarity values, GSMILES selects a critical subset of objects (identifying the locations of the tent poles) at step  908, that can optimally predict the Y-values (or other values being solved for) of all objects within the precision limitations imposed by nuisance effects, assured by statistically valid criteria. The selection may be made by an iterative algorithm as was discussed above, and which is further referred to below. Upon identification of the tent pole locations and similarity values representing the tent poles, as well as an estimation of the X-nonlinear transformation (“a values”) of the Y-profiles associated with the strategic X-profiles (tent poles) by least squares regression or other optimization technique, GSMILES maximizes the number of tent poles at step  910 to minimize the sum of squared prospective errors between the X- and Y-profiles. At step 912, GSMILES then trims back the number of tent poles (by “trimming”, as described above), where the GSMILES model is trimmed back to the minimum of the prospective sum of squares to optimize prospective predictions, i.e., to remove tent poles that contribute to over fitting of the model to the data used to create the model, where even the noise associated with this data will tend to be modeled with too many tent poles. Trimming may be carried out with the aid of Leave-One-Out cross validation techniques, as described above, or by other techniques designed to compare training error (fit error) with validation error (test error) to optimize the model. FIGS. 11 and 12 illustrate an example of such comparison. FIG. 11 plots  1100 the maximum absolute (ensemble) error versus the number of tent poles used in developing the model (training or fit error versus the number of tent poles). It can be observed in FIG. 11, that the error asymptotically approaches a perfect fit as the number of poles is increased. FIG. 12 graphs 1200 the square root of the sum of the squared LOO errors divided by the number of terms squared and plot this against the number of tent poles, as a measure of test or validation error (described above). It can be seen from FIG. 12, that somewhere in the range of 60-70 tent poles, the error terms stop decreasing and begin to rapidly increase. By comparing the two charts of FIGS. 11 and 12, GSMILES makes the determination to trim the number of poles to the number that correlates to the location of the chart of FIG. 12 where the error starts to diverge (somewhere in the range of 60-70 in FIG. 12, although GSMILES would be able to accurately identify the number where the minimum occurs, which is the point where divergence begins). The poles beyond this number are those that contribute to fitting the noise or nuisance variables in the chart of FIG. 11. After optimization of the model, the model is ready to be used in calculating predictions at step  914. Upon calculating prediction values, the present invention may optionally employ a scoring method. Score functions are optimized for every outcome in the modeling process. For example, multivariate probabilities of survival and/or categorical outcomes can be optimally assigned to the GSMILES scores. If appropriate, the distributional property of each outcome is then used to optimally assign a probability function to its score function. The modeled score/probability functions may be used to find regions of profiles that satisfy all criteria/specifications placed upon the multiple outcomes. The profile components can be ranked according to their importance to the derived multi-functionality. FIG. 10 is a flow chart  1000 representing some of the important process steps in one example of an iterative algorithm that GSMILES employs to select the columns of a similarity matrix, such as similarity matrix T described above. To solve for the critical profiles, an initial model (i.e., Model Zero) is inputted to the system at step 1002, in matrix T, as described above with regard to FIG. 5. A least squares regression is next performed at step 1004 to solve for the α coefficients (in this iteration, it is the α0 coefficients) which provide a best fit for the use of the model (which includes only Model Zero in this iteration) to predict the Y-profiles (or X-profiles or X- and Y-profiles, or whatever the output variables have been defined as, as discussed above). Next, the residuals (prediction errors e) are calculated at step  1006, as described in detail above with regard to FIGS. 5-6. The residual values are then analyzed by GSMILES to determine the absolute error value that meets a predefined selection criteria. As described above, one example of a predefined selection criterion is maximum absolute error, which may be simply selected from the residuals when the residual is a vector. However, when the residuals take the form of a matrix, as in FIG. 6, an ensemble error is calculated for each row of the matrix by GSMILES, where the ensemble error is defined to leverage communalities. The ensemble errors are then used in selecting according to the selection criteria. Examples of ensemble error calculations are described above. Although the above examples use maximum absolute error as the selection criterion, other criteria may be alternatively used. Examples of alternative criteria are mean (ensemble) absolute error, median (ensemble) absolute error, mode (ensemble) absolute error, weighted average (ensemble) absolute error, robust average (ensemble) absolute error, or other predefined error measure. The residual error value (or ensemble residual error value) meeting the selection criterion is identified at step 1008. GSMILES then selects the X-profile row from the input matrix (e.g., matrix  240) that corresponds to the row of the residual matrix from which the residual error (or ensemble error) was selected. This identifies a potential location of a tent pole to be used in the model. At step 1012, GSMILES then calculates similarity (or dissimilarity) values between the selected X-profile row and each row of the input matrix (including the selected row) and uses these similarity values to populate the next column of the similarity matrix T, assuming that the selected X-profile row is not too close in its values (e.g., collinear or nearly collinear) with another X-profile row that has already been previously selected, as determined in step 1014. If it is determined that the values are not collinear or nearly collinear with a previously selected tent pole profile, then the similarity values calculated in step  1012 are inputted to the next column of similarity matrix T at step 1016. The process then returns to step 1004 to perform another least squares regression using the new similarity matrix. If the column of the selected row selected is determined to be collinear or nearly collinear with Model Zero and all other columns of matrix T (from previously selected X-profile rows), via step 1014, GSMILES rejects the currently selected X-profile row and does not use it for a tent pole (of course, it wouldn't determine this in the first iteration if Model Zero were selected as a null set, since there would be no previously selected rows). Then GSMILES determines whether there are any remaining rows of the X-profile which have not already been selected and considered at step 1018. If all rows have not yet been considered, then GSMILES goes back to the residual error values, and selects the next error (or ensemble) error value that is next closest to the selection criterion at step 1020. For example, if the selection criterion is maximum absolute value, GSMILES would select the row of the residual values that has the second highest absolute error at this stage of the cycle. Processing then returns to step  1012 to calculate similarity values for the newly selected row. This subroutine is repeated until a new tent pole is selected which is not collinear or nearly collinear with Model Zero and all previous T-columns, or until it is determined at step 1018 that all rows have been considered. When all rows have been considered, the similarity matrix has been completed, and no more tent poles are added. An optional stopping method is shown in step  1009, where, after the step of determining the absolute error or ensemble error value that meets the selection criteria in step 1008, GSMILES determined whether the selected absolute error value is less than or equal to a predefined error threshold for the current model. If the selected error value is less than or equal to the predefined error threshold, then GSMILES determines that the similarity matrix has been completed, and no more tent poles are added. If the selected error value is greater than the predefined error threshold, then processing continues to step 1010. Note that step 1009 can be used in conjunction with steps 1014, 1018 and 1020, or as an alternative to these steps. h) repeating steps b) through g) until a predefined stopping criterion has been reached. 2. The method of claim 1, wherein the step of performing an optimization procedure comprises performing a least squares regression procedure. 3. A method comprising forwarding a result obtained from the method of claim 1, to a remote location. 4. A method comprising transmitting data representing a result obtained from the method of claim 1 to a remote location. 5. A method comprising receiving a result obtained from a method of claim 1 from a remote location. 6. The method of claim 1, wherein the predefined stopping criterion comprises a determination that all error criteria of the residual matrix are within bounds of a predefined error threshold having been predefined as acceptable for an intended application of the model. 7. The method of claim 1, wherein the predefined stopping criterion comprises determining that all remaining rows of the matrix of multivariable inputs which have not been used to calculate similarity values to populate a column of matrix T are collinear or nearly collinear with at least one of the rows of the matrix of multivariable inputs which have been used to calculate similarity values to populate a column of matrix T.
8. The method of claim 1, further comprising trimming the number of columns in the T matrix to an optimized minimum number to optimize prospective predictions. 9. 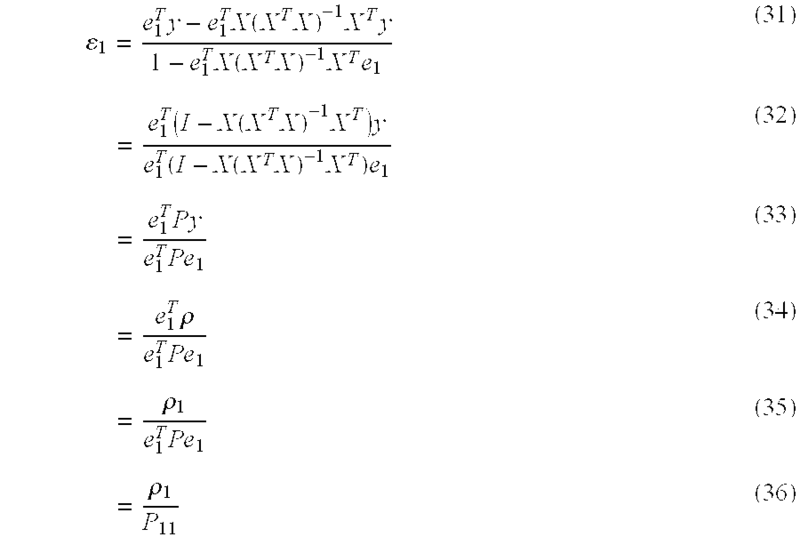 The method of claim 1, wherein the pre-defined error criterion comprises maximum absolute ensemble error. 10. The method of claim 1, wherein the pre-defined error criterion is selected from the group consisting of: mean absolute ensemble error, median absolute ensemble error, mode absolute ensemble error, weighted average absolute ensemble error, and robust average absolute ensemble error. 11. The method of claim 1, further comprising estimating validation error of the model derived using the leave-one-out (LOO) cross validation technique. Pii is the diagonal of the projection matrix corresponding to the ith profile. multiplying the n rows of the similarity matrix T by the α matrix to arrive at predictions of the Y-profiles, within an acceptable predefined range of error. generating the predictor model according to claim 1 through use of X-variable profiles as both the multivariable inputs and the multivariable outcomes; wherein the identified rows populating the similarity matrix T are essential profiles of the prediction model, and wherein the predicted multivariable outcomes smooth the X-variable profiles input function, reduce noise due to the nuisance variables, and restrict candidate profiles in the X-variable profiles to enhance causal leverage between profiles. repeating steps b) and c) until differences between the current replacement modifications and the previous iteration of replacement modifications are less than a predefined threshold value of correction difference. generating the predictor model according to claim 1 through use of the X-variable profiles as the multivariable inputs and both the X-variable profiles and Y-variable profiles as the multivariable outputs. 17. 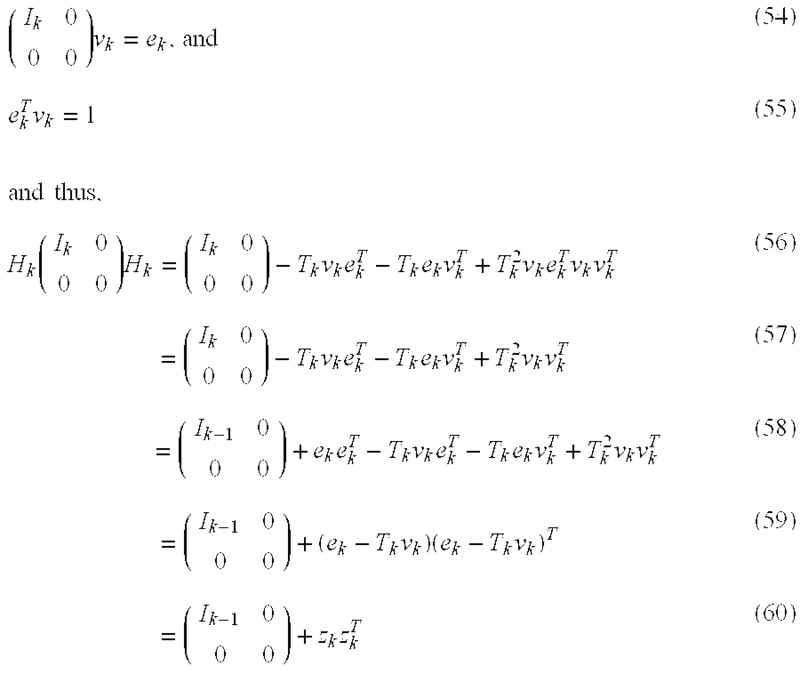 The method of claim 16, wherein the X-variable profiles and Y-variable profiles are stacked vertically to form a combined matrix of the multivariable outputs. 18. 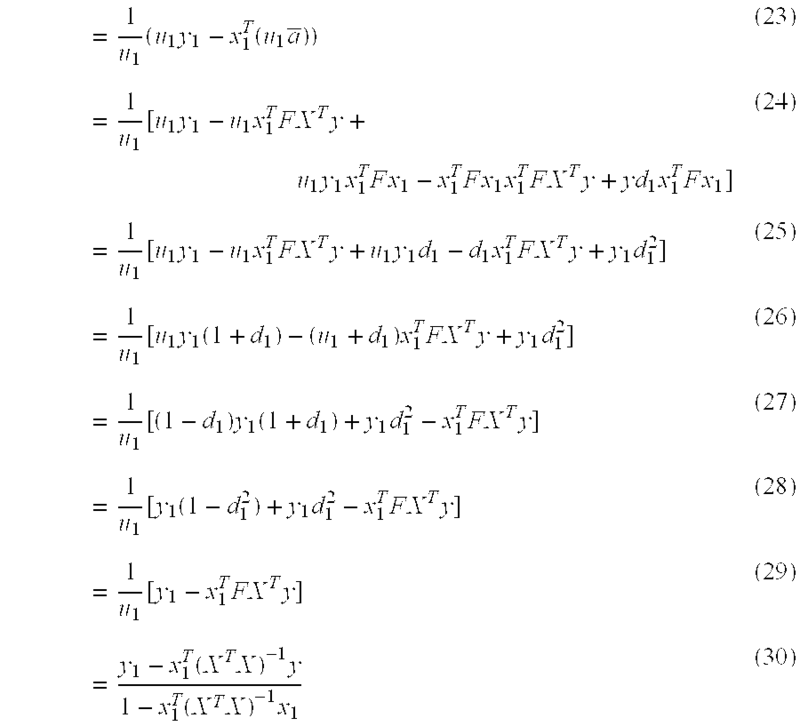 The method of claim 16, wherein the X-variable profiles and Y-variable profiles are concatenated horizontally to form a combined matrix of the multivariable outputs. 19. The method of claim 16, wherein the identified rows used to calculate similarity values used in populating columns of matrix T are strategic X-profile rows, and wherein said method further comprises clustering the strategic X-profile rows in a combined matrix defining both the X-variable profiles and Y-variable profiles. generating the predictor model according to claim 1 through use of an X/Y matrix, resulting from the catenation of the X-variable profiles and Y-variable profiles, as the multivariable inputs and using the X/Y matrix as the multivariable outputs. 21. The method of claim 20, wherein said step of identifying a row is restricted to only the X-profile portion of the X/Y input matrix, resulting in enhanced causal leverage between the X- and Y-profiles. 22. The method of claim 1, further comprising assigning score functions to the multi-variable outcomes for use in any multivariate distribution process. 23. The method of claim 1, further comprising testing the ellipticity of the identified rows of X-profiles as a function of the X-space, using the Marquardt-Levenberg algorithm, and ranking the X-variable in the identified rows of X-profiles according to said testing. 24. The method of claim 1, further comprising determining a decay constant for each of the identified rows of X-profiles used to calculate similarity values to populate the T matrix. setting each decay constant as the inverse of a largest of dissimilarity values calculated between each data location and the domain simplex of the data adjacent to that data location. 26. The method of claim 25, further comprising adding data points to each domain simplex to form a domain complex. optimizing the number of tent poles to minimize the error between the X-profiles and the Y-profiles. 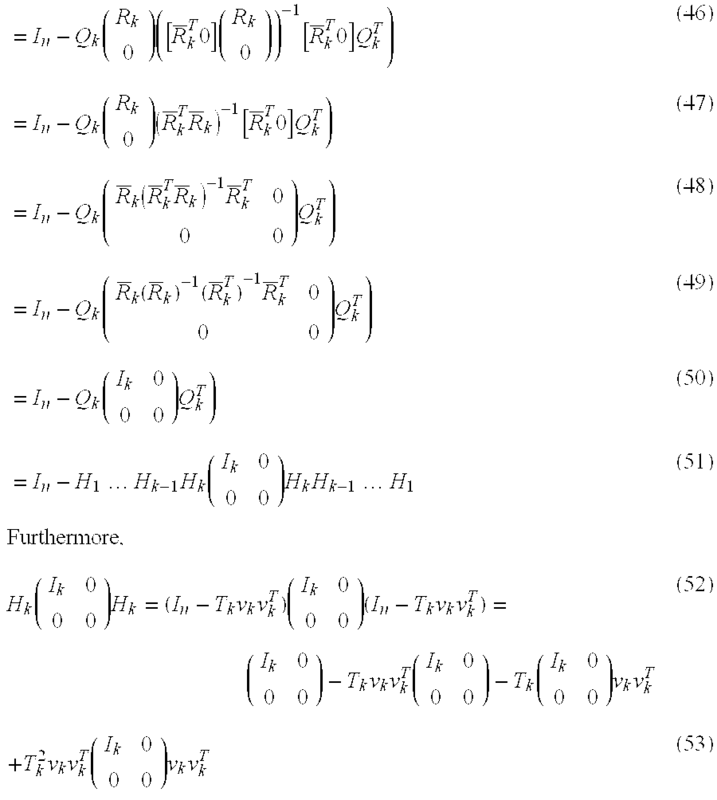 means for determining when to stop populating columns of similarity matrix T.
29. The system of claim 28, further comprising means for trimming the number of columns in the T matrix to an optimized minimum number to optimize prospective predictions. 30. The system of claim 28, further comprising means for estimating validation error of the model derived using the leave-one-out (LOO) cross validation technique. means for optimizing the number of tent poles to minimize the error between the X-profiles and the Y-profiles. 34. The computer readable medium of claim 33, wherein the following further step is performed: trimming the number of columns in the T matrix to an optimized minimum number to optimize prospective predictions.